Too bad "Precious" makes you feel bad for leading a normal life. Gee, I felt guilty for having the luxury of even watching that movie in theatres. 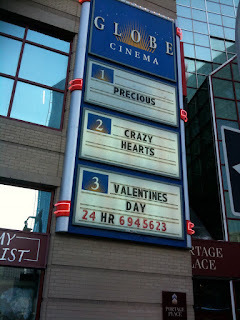 I told the management at Globe Cinema that their sign has had an unnecessry 'S' for about three weeks. He gave me a very strange look. See, I didn't get the chance to see any of those movies on Valentine's Day, because I was really busy stuffing myself full of marshmallow goods with no expiry date until I couldn't feel feelings anymore. Shame, really.